It happened again! The Chaos Communication Camp took place a couple of weeks ago near Berlin. I was all excited to go although I had to miss the last days of the Desktop Summit. The weather was mostly nice and the atmosphere, especially at night, was really fantastic. Everybody was really nice and there was so much creativity all over the venue that it was really hard to not start to make or hack on something. While it had many very interesting things to be seen, I think to most amazing machine on the ground was a “Crepes printer”. Some austrian dude built a machine which would make you a fresh crepe. Including some chocolate sauce! Just right next the that were some friends that intend to launch a sattelite and already had their radio equipment ready. With their massive antenna they spoke to the moon and measured the reflections coming back. 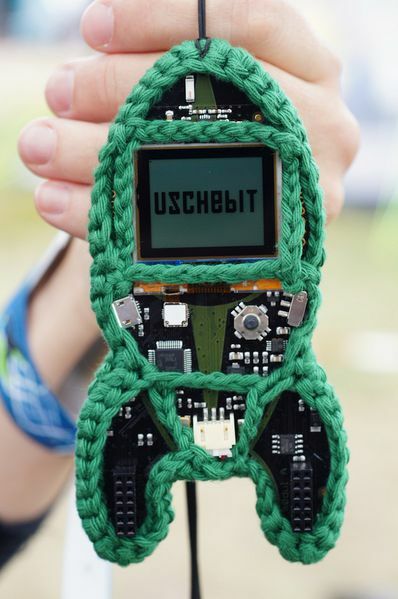 The participants also got a fancy badge called “r0ket“. It’s an amazing device and people did awesome stuff with it immediately. Given the presence of 3D printers and lasercutters, people added all sorts of extensions to the r0ket. But some enhanced their r0ket with good old knitting goodness. The whole CCCamp, taking place on an old russian airbase, was themed very aeronautical so everything was somehow related to space travel or rocket science. It also had many talks on those subjects which I didn’t attend a lot. I was too busy hacking or socialising. You can see some more pictures and press articles in the CCCamp Wiki. The next Camp will be “Observe. Hack. Make. 2013.” and I’m very much looking forward to attend it. Previous Previous post: Spare Thinkpad x60, x60s, x61 or x61s anybody?